LPAC will host our annual 5 x 5 public art slide show in the Fall of 2019. The annual 5 in 5 Slide Show is a public art idea swap. Participants have 5 minutes to show 5 images of public art from anywhere in the world. Dream big and share your images of projects you would hope to have incorporated in the Laramie community, Or simply join us to hear from fellow community members about interesting public art they have seen. Images may be from your travels in person or online, we want to see what public art inspires you. Watch here for information about submitting you five photos. 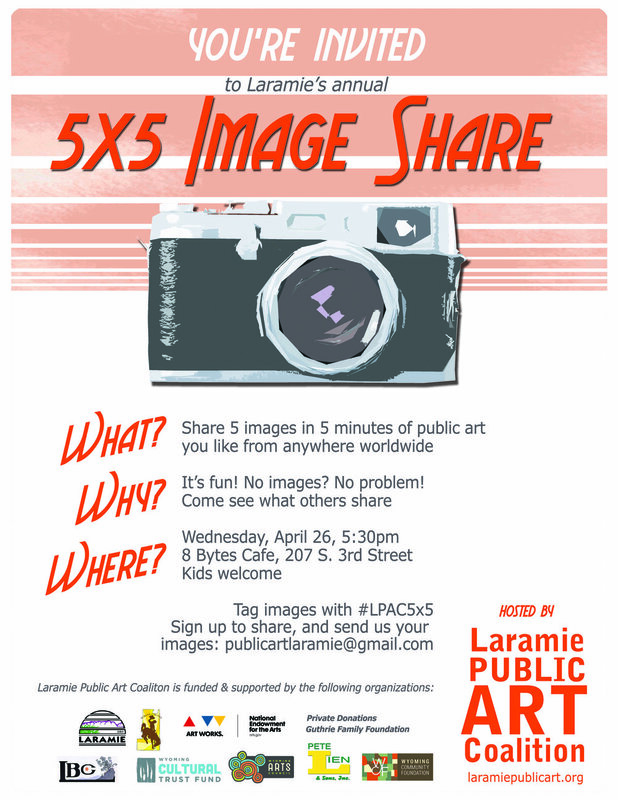 In the meantime share your favorite public art on social media using these hashtags: #lpac5x5 and #laramiepublicart. Public Art and Monuments Tours! Join us this summer for our public art and monuments tours! If you have a special request for a tour time/day not on this list, contact us and we will see if we can accommodate it. Join us in kicking off our 5x5 Campaign! LPAC is proud to be one of the hosts for this amazing art group. Click image for more information about them. Hope to see you all there! On Sept. 15 at 5 pm we will be dedicating Laramie artist Stan Dolega's 3D installation at the intersection of Third and I-80. Participants are encouraged to park on 2nd Street and walk to the site as no parking is available on location. We'll be giving a brief update on our current projects, what we are working on behind-the-scenes and our 5 Year Work Plan on July 26 at 6 pm in City Council Chambers at 4th and Ivinson. All are welcome. The Laramie Public Art Plan will be presented at a community meeting on Friday, June 26, 2015 6pm-8pm. Come join us to learn about the final plan and celebrate this great process! The Laramie Public Art Plan will be presented to City Council on Thursday, June 25, 2015 at 6pm. The public is invited to hear a presentation of a draft outline of the public art plan that will be presented to City Council. Grab a coffee and hear about the Laramie Public Art Plan and see examples of public art projects that engage the landscape or use natural elements in creative ways. After a short presentation, gather in small groups explore the Greenbelt and take photos of places for art. When you return, each group will be asked to place their locations on a map of the Greenbelt and share photos of the places they discovered. Don’t want to be confined to the trail? People are welcome to bring ideas for art in other locations that engage the landscape in Laramie. Our initial meetings in Laramie and our survey results have said that people would like to see more public art along Third Street. What opportunities do you see? Hear about the Laramie Public Art Plan and see examples of public art projects located in downtown settings. After the short presentation, we will break up into small groups to walk Third Street and identify the places of transformation. When you get back, there will be some light snacks and a map for you to plot your locations. You can also share your photos of the places you find. Want to keep talking? Great. We will continue with an unofficial workshop at a downtown restaurant for a buy-your-own dinner and drinks. Did you miss the community public art conversations in February? Or maybe you attended them and want to share more of your own ideas. Bring your lunch and your imagination to this lunch and learn. See examples of public art projects and participate in a discussion about the types of projects you would like to see in Laramie. All ages welcome. Renee Piechocki and Jennifer McGregor, the consultants who are organizing the plan, are hosting two discussions about public art. They will be showing examples of public art projects and discussing places in Laramie that would be good locations for public art. Following the presentation, the community will be asked to provide feedback about the examples and discuss public art options in Laramie. Everyone is invited to attend and participate! Families are welcome; art supplies will be available for kids to create with. Light refreshments will be provided to fuel creative thinking! Renee Piechocki, Jennifer McGregor, and Meg Thompson held small meetings with groups of artists and stakeholders from the Laramie community. In addition to great conversations, we toured all of Laramie's neighborhoods, learned about new and upcoming development and design projects, visited every coffee shop in town, ate more than a few Daylight Donuts, and went for a great hike in Vedauwoo. Thanks to everyone who participated in the meetings and tours.